Wondering if geese really have teeth? Or if it's all just a clever internet scam? You're in the right place! We've got the low down on all things goose teeth related. 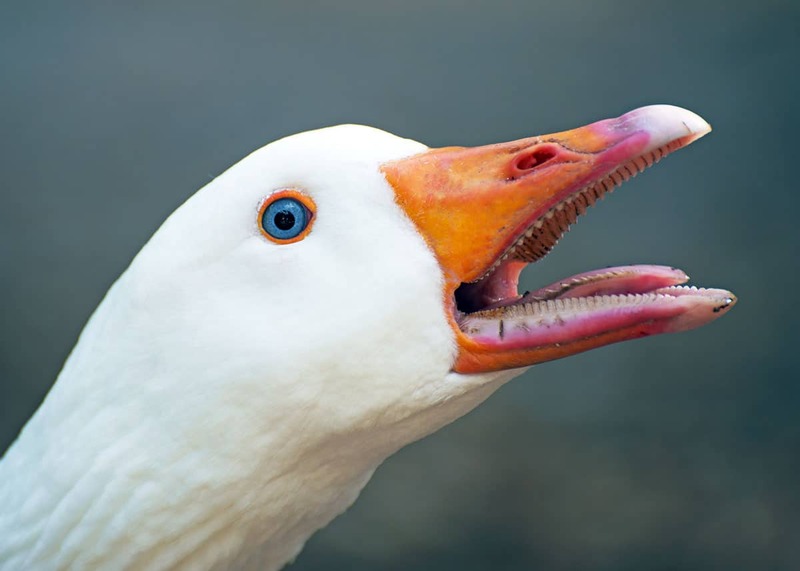 Geese Can't Really Have Teeth… Can They? 1. Do geese have teeth? 2. Are goose teeth really teeth? 3. Are goose teeth sharp? 4. Did geese have teeth in the past? 5. Do geese have teeth on their tongues? 6. Why do geese have teeth on their tongues? 8. Why do geese get aggressive/attack? 9. Do geese attack people? 10. How many people are attacked by geese? 11. Do Canadian geese attack people? 12. Has a goose attack ever killed anyone? 13. How do you know if a goose is about to attack? 14. How can you avoid a goose attack? 15. What do you do if a goose attacks you? 16. How do you scare away geese? 17. Do geese bite people? 18. Do goose bites hurt? 19. What other ways will a goose attack you? 20. Do geese kill chickens? There are a lot of myths and misconceptions about goose teeth, so I'd like to clear some of them up for you. If you're curious about what's really happening under their bills, here's everything that you wanted to know about goose teeth but were afraid to ask! 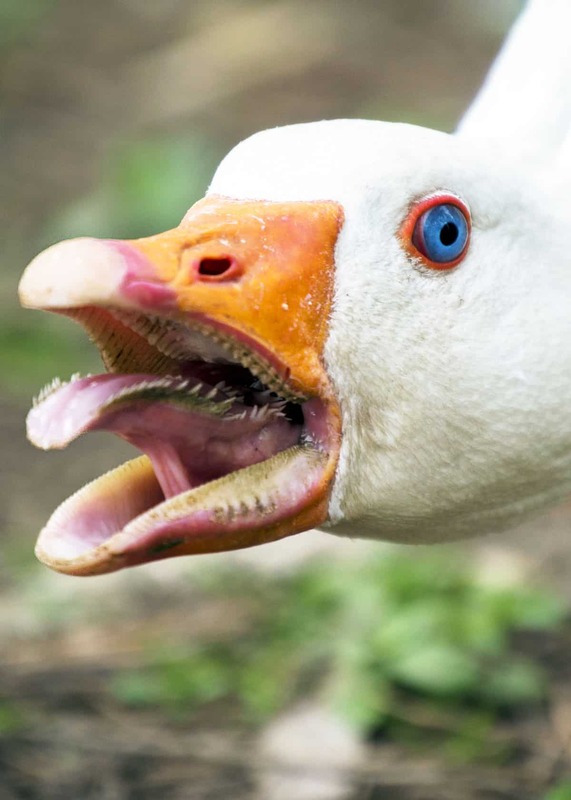 If you look at pictures, it seems obvious that geese have teeth. There are sharp, pointed white things lining the interiors of their beaks, and the geese use these tools for everything from catching snails to ripping up grasses. But is that what really makes a tooth? The answer might surprise you. No. Rather than true teeth, geese are in possession of hard, spiky cartilage known as tomium. It looks and functions the same way as a row of teeth, but it's a growth made from the beak itself. One distinguishing feature of tomium is that it doesn't have any enamel. Enamel is the hard, protective layer that covers real teeth in humans and other mammals. If you look closely at pictures of goose teeth, you can tell that they lack enamel. They're all cartilage. Don't be fooled by the word “cartilage.” Tomium isn't soft or pulpy. It's a bone-hard material that the geese use to rip through both vegetation and living prey, so it shouldn't be underestimated. It can easily draw blood after a bite. Scientists believe that birds used to have teeth 80 – 100 million years ago. It could be that birds with larger “teeth” have gone extinct or that the teeth have been bred out of them. Whatever the case, birds today have small teeth-like formations – thankfully. It's okay if you gasp in horror at the sight of a goose's tongue. Those long, saw-like rows of teeth definitely look like something out of a movie where humans tamper with nature and create killer animals that rampage through the night. Don't worry too much about geese taking over the world… yet. These “tongue teeth” are another example of tomium. They're usually called serrations or serrated tongues rather than teeth. There are practical reasons for having teeth on your tongue, especially when you're a goose. First of all, since geese feed primarily on grasses, grains, roots, and stems, all of their teeth assist in ripping vegetation from the ground. They'll clamp down their beak on a tuft of grass and shake their head sharply to sever it. Their teeth are used for gripping. Another benefit of a serrated tongue is being able to hold onto small prey like insects and rodents. These animals are less likely to escape when spikes are digging into them. Remember: Tomium might not be as tough as real teeth, but it's still able to do some damage. Geese can get pretty aggressive. If you live near a pond or lake, you've probably seen them acting combative. They might fly or flutter after people that they perceive as a threat; they might even chase a hapless jogger who ventured too close to their nest. They definitely aren't shy. Geese aren't violent or vicious creatures by nature, but they're extremely territorial. They don't like anyone in their space, and they aren't afraid to defend that space by going after predators and trespassers. They can get especially hostile during the breeding season. Females will rigorously guard their eggs; males will rigorously guard their females. Both will lash out at perceived threats. Yes. If geese were ever afraid of humans, their long proximity to our species has dampened that instinct. That “they're more afraid of you than you are of them” saying doesn't work for geese. Have you ever seen viral videos of people being attacked by geese? They are pretty funny… until a crazed goose is flying straight for your head. The biggest headlines are always for unprovoked attacks on campers or swimmers, but there are plenty of others. People have even been swarmed by gaggles of geese after trying to feed them. Most of these attacks aren't serious, but they demonstrate how little fear that geese have for humans. They'll go after men, women, children and the elderly without discrimination (what? you wanted equality). If they're feeling aggressive, they'll attack. It's hard to pinpoint an exact number for geese attacks because many of them go unreported. It's also hard to narrow down specific places where geese have gotten aggressive; different neighborhoods in the same community can have wildly different rates of attack. For example, parks and playgrounds might never be bothered by geese while golf courses might have a persistent problem. The U.S. Fish and Wildlife Service Division of Migratory Birds did report that 107 people were attacked by geese in 1999. It's an outdated figure, but it should give you an idea of how common that these human-bird skirmishes can be. Yes. There are some differences between Canadian geese and other species of geese, but when it comes to their behavior when they're feeling threatened, all of them will put their dukes up. Good news! There have been no documented cases of fatal goose attacks. They might hurt you, but they won't kill you. The goose is staring at you. If they just flick their eyes in your direction as you walk by, you're probably okay. If their attention is fixed on you, however, you might have an issue. A direct, head-on stare from a goose means that they're eyeballing you as a threat. The goose stretches or cranes their neck. Neck extension is a “back off” warning in the goose world. It doesn't always lead to physical violence, but it's a sign that things are escalating. It might be accompanied by honking or hissing. The goose pumps their head up and down in a vertical motion. This is often the last sign before an attack. It's pure conflict behavior. If a goose is pumping their head at you, it's time to take the situation seriously. Don't panic. Any signs of fear, stress, anger or hysteria can trigger their knee-jerk instincts and make them launch into an attack. Walk backward with your eyes remaining on the goose. Don't turn around, and don't rush your retreat. Walk slowly. Keep a calm, measured pace, and make sure that you don't trip over anything. A fall can startle a goose into reacting. Do not behave aggressively towards the goose. Don't shout or wave your arms. It won't intimidate them at all; in fact, it will make them get even more defensive in the face of a large predator who is suddenly moving and making lots of noise. It should be obvious, but don't allow children to chase geese! This will be perceived as a threat and make it very likely that the goose will attack the child. Lastly, don't feed geese. Geese can become aggressive, even attacking the person holding the food. They will get braver the more they are fed, so avoid encouraging them. Stay calm. This is easier said than done, of course, but try to remember that a goose attack won't kill you. There's no need to fight like your life depends on it. Stay on your feet. Don't fall, hunch, double over or curl into a fetal position on the ground. Geese don't understand submissive gestures like this, so they'll just keep attacking your prone form. Protect your face and neck. Put your hands or arms over your face. If you can't avoid a goose bite, make sure that it doesn't land on anything delicate. Move at a 90° angle. Geese don't have a lot of dexterity once they've decided on a flight path, so by ducking or stepping at a 90° angle whenever they launch themselves at you, you can avoid the worst of their attack. Don't run. The goose will simply chase you. Keep backing away from their territory with your hands protecting your face until the goose no longer sees you as a threat. Inform the proper authorities. If the geese are enough of a problem, the local authorities may get involved to protect the population. Lastly, be sure to get medical attention if you are bitten or hit by a goose. Geese are surprisingly strong and can even break bones with their strong wings, so be sure to get medical attention if you are worried at all. Is your backyard being overrun with geese? There are a few tactics that you can try to make them go away. The most effective method is to scare them with moving visual ornaments. Geese use their eyes for hunting more than anything else, so if you have lots of flags, streamers and eyespot balloons on your property, the geese won't even want to land. They'll consider it too dangerous. Another technique is to use sudden, surprising noises. Propane cannons and whistle bombs can startle the geese into flight, and if these shocks are repeated every time that they land on your property, they'll get the message eventually. The only downside is that noise-making devices might be restricted in your neighborhood by your homeowner's association, so double-check the rules before you buy anything. Yes. Goose bites aren't as dangerous as other animal bites, but they can still break the skin and cause bruising, bleeding and swelling. They can also get infected, so if you see any signs of that, don't hesitate to reach out to a medical professional. It depends on the severity of the bite. It might feel like nothing more than a pinch; it might cause pain that lasts for days. Generally speaking, attack bites are worse than other bites. An accidental nip during a hand-feeding is much different than an angry dad trying to defend his eggs. Wouldn't want to let him bite you! In addition to biting, geese will aggressively flap their wings at their opponents. This can pack a hefty amount of force; people have reported things like broken noses after being struck in the face by goose wings. It's like being hit by a 10 – 15 pound punching bag with a reach of 4 – 6 feet. That's their average weight and wingspan. Yes. It isn't common, but it happens. Geese are territorial birds that are prone to biting, grabbing or “holding” chickens that get into their space. The results can be fatal if the goose is particularly angry or the chicken is particularly feeble. Have you learned a thing or two about goose teeth? They might not be the prettiest things in the world, but they serve an evolutionary purpose, and they're not quite as horrifying as they appear at first glance. You can sleep easily tonight knowing that those razor-like lines of teeth won't bother you as long as you're careful!